The reason February 15th is the most wonderful time of the year is because the emphasis on the need to be in a relationship is gone. I don’t feel the need to be in one and I’m glad the day has passed. I’m happy with the way things are and I don’t need my entire world telling me relationships are the be all and end all to happiness. Does that mean I don’t want to be in one? No, it does not. What it means is that it’s going to take someone really special who can completely sweep me off my feet to convince me to be in one. Remember that? That was from my February 15th post, from last year. The post, specifically written the day after Valentine’s Day, touched on how I was enjoying being single, how my non-date Valentine’s dinner date the evening before had actually been wonderful, and how I thought that I deserved the goat in the arranged marriage I was willing to accept since I was getting sick of the playing the dating game. My, how things can change in a blink of an eye. 2 days after I had written that blog, I met the guy who would turn my life upside down in the best way I could ever imagine. While I’m not going to use this post to describe the story of how Matt and I met (since I’m saving hat for another time 😉 ), I’m just going to say that it was an unexpected and life-changing surprise. Those who know me, know that I love surprises, and that’s exactly how this year’s Valentine’s Day began. On February 13th, Matt came home with these gorgeous flowers for me. 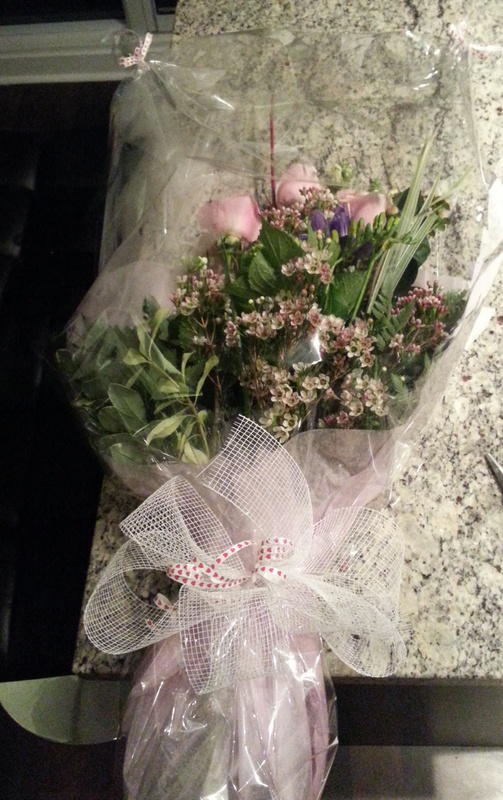 Everyone expects flowers on February 14th, but I was wonderfully surprised when he came home with them a night early. I mean, hello! It meant I had 2 days of Valentine’s plans! A week or so, ago, Matt and I had a discussion about Vday and whether or not we should do anything to acknowledge it. After all, we spend every day expressing our love for one another (ew, barf, I know), so it wasn’t like we really needed a special day for it. Matt was pretty neutral when it came to the day, but I decided I wanted to celebrate. Having had only terrible Valentine’s experiences with exes in the past, and spending the rest of my life Valentine-less (except for my mom…), I didn’t want to let this year go to waste. I wanted real Valentine’s plans. While I fully understand that this holiday had been invented to boost economic spending and to put undue pressure on people to show their love, I still wanted to do that. You know, at least once. Besides, we had decided to keep it simple. So, of courssssse, I did…. I spent the entire afternoon cooking a giant meal for Matt, which included a homemade wheatberry salad with toasted walnuts, dried cranberries, et al with a lemon dressing, tenderloin with caramelized onions and asparagus wrapped in prosciutto, drizzled with a homemade balsamic glaze. 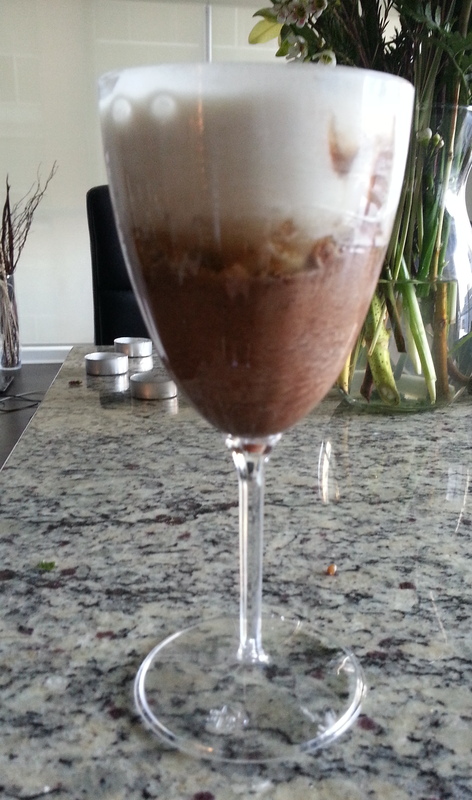 I also made a dessert called “S’mores in a glass,” which consisted of homemade chocolate coffee mousse, graham cracker crust, and from-scratch marshmallow topping. Usually, I like to get fancier in my desserts, but this was a recipe Matt and I had seen being made on a cooking competition show called “Come Dine With Me Canada,” and he made a comment about how delicious it looked. So, naturally, I found the contestant on Twitter and asked her to email me the recipe. The meal was waiting for Matt when he came home to the dimly lit apartment full of glowing candles, and of course, those gorgeous flowers, making for some lovely decoration. He ate, we drank, and the time passed by, almost too quickly, as we caught up on the things we hadn’t talked about in forever. You see, while Matt doesn’t technically live with me, he does “come home” to me, as most of us his stuff is here and he has a parking spot in my building. However, even though I see him every day, we have fallen into the routine of coming home at the end of the work day, eating, watching TV, and going straight to bed. Having special time set aside for us to really talk was a wonderful change. It also helped that we had special time set aside for that “Valentine’s Romance,” but I’m not going to go into those details.. ha! While we enjoyed all the things that Valentine’s brings, we couldn’t help but do what we do best together. After all the fancy food, the drinks, the gifts, and the romance, we put on our sweatpants, turned on Netflix, and watched one of the new episodes of House of Cards. 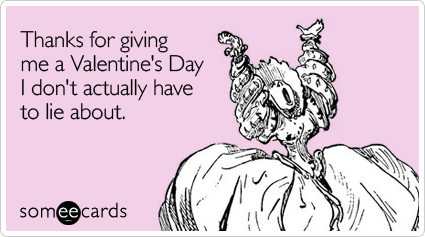 I finally see what all the fuss of Valentine’s Day is really about. It’s not about rubbing your love in other people’s faces (as I’ve seen some people do via social media), and it’s not about forcing your significant other to buy you gifts. Valentine’s Day is really just about focusing on the person that you love and working on making your relationship as strong as it can be. It was in the card that I wrote for Matt that went with his gift that I explained how happy I had been once been being single, and that it wasn’t until he came along that I realized just how much happier I could be. Don’t get me wrong, I stick by what I had written last year on this very day. I enjoyed being single. I enjoyed only having to worry about myself and doing whatever I wanted, when I wanted. I also stick by what I said when I wrote that someone really special would have to come along to change my mind. It just turns out that he did. No plans? There’s always today – Singles Awareness Day! Enjoy it.